A sea of St. Paul’s students exit school buses to pair up with chaperons for a their visit to the National WWII Museum. 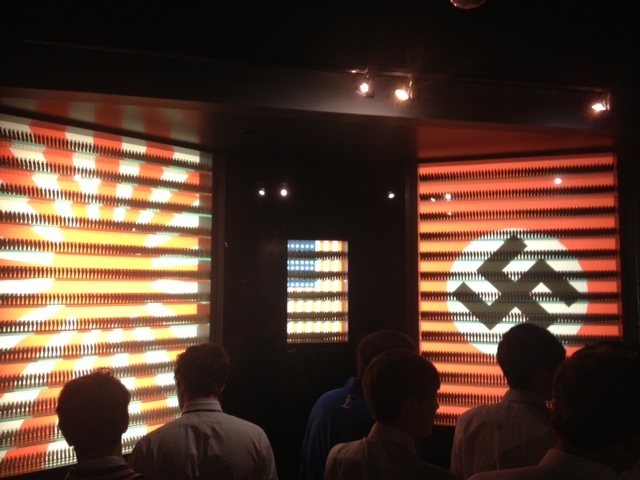 The St. Paul’s School junior class visited the National World War II Museum in New Orleans on Thursday, Mar. 13, as a field trip for American History class. They arrived at the museum around 9:00 a.m., and a sea of white collared dress shirts and school ties flooded the scene in front of the museum, ready for an intense day of learning and understanding of the events and conditions many men had to fight in during the second World War. As everyone made their way into the museum, the class of around 180 students split up into groups of 10 and 11 with a pair of chaperons per group. As the groups went through the hallways filled with actual uniforms, ammo, and WWII veterans, the interest level of the junior class was through the roof. Students were reading the captions by the pictures and listening and asking intelligent questions to the veterans. One veteran to whom the students showed the most interest was Tom Blakey, a veteran paratrooper whose job it was to jump out of planes, landing onto various battlefields by parachute. The students were in awe of this man, who showed tremendous courage and willpower to jump out of planes and fight for his country, which is why he is considered an American hero. “Mr. Blakey explained to me what it was like jumping from the planes and fighting on the ground, and it was very eye-opening for me to realize how much our troops do for us,” said junior Eric Fecke. After finishing the walk through the museum, the juniors went to eat a delicious ham and turkey lunch. The museum had a milkshake store, and more than half of the class went and bought seven-dollar milkshakes with their meals. After the 45-minute lunch break, the juniors went into the movie theater for an hour-long, 4-D movie, “Beyond All Boundaries.” The 4-D movie includes surround sound, vibrating seats, and real moving objects that are not on the screen that come into play along with the movie. The movie was the highlight of the trip for most students, not just because they got to sit down and relax, but because it showed how ordinary Americans gave up their normal lives to go and fight for their country when they were needed. The vibrating seats and exciting action on the screen helped keep everyone engaged, as well as the story the movie portrayed. Pictured on the screens during “Beyond All Boundaries” are images of tiny soldiers representing the countries of Japan, America, and Germany. Each little soldier represents 2,000 real soldiers who fought and were killed in action during the war. As the junior class headed out the theater and back onto the bus, everyone was left with a positive attitude. Everyone who talked about the trip had only great things to say about it and found at least one thing that struck their interest. The bus ride back to St. Paul’s felt like a short one because the talk of the museum kept everyone interacting and not paying attention to where they were or how much longer it would take to get back to school. This tripped helped students to realize what veterans actually did for us and gave them a chance to see how they lived and fought in this brutal war. Also, it helped students get a preview of what was to be expected in the book they are about to start reading “The Things They Carried,“ a book about author Tim O’Brian and his experiences in the Vietnam War.